Through this program, the fellows get exposed to the grassroots realities of India’s education system and begin to cultivate the knowledge, skills, and mindsets necessary to attain positions of leadership in education and identify their role in building a wider movement for educational equity in the country. Stage 1: Interested candidate will apply for the program and take an online test named AMCAT. Stage 2: The telephonic interview will be done after strict scrutiny of the application form. Stage 3: In the last stage – an in-person Assessment Centre will be done where the applicant teaches a 5-minute lesson, participate in a group discussion and complete a short problem-solving activity. 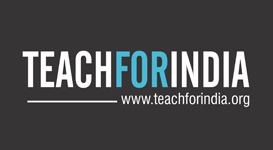 In 2018, Teach For India Fellows will be placed in seven cities: Mumbai, Pune, Delhi, Hyderabad, Chennai, Ahmedabad, and Bengaluru. The last date for registering has been extended to March 25. For more information,please click on this link.